Fire Starters are a great little item to get your logs going in a fast, easy way! Simply place one or two in between your logs and light the wicks. They will burn long enough to get your fire going and be completely consumed with no trace of them left! Use for outdoor camping, fireplaces or with your charcoal chimney for BBQ's. 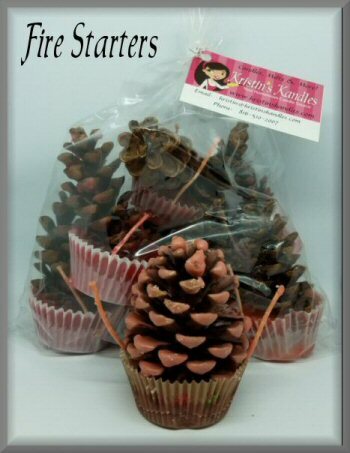 These look cute in a basket on your hearth and smell good too! Great gift for those hard to buy for people! Each set is packaged in a cello bag. 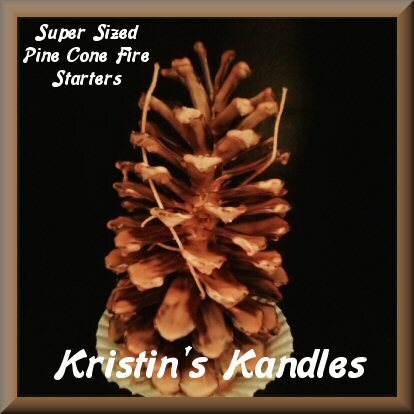 Great for all the uses listed above and also for those hard to start fires & larger logs! These are approximately 9 inches tall.